Every now and then I get a bug to make something different since Michigan loosened the rules for the shotgun zone. Last year was the 500AIMM which is a 300 RUM or any full length RUM case, cut back to 1.800 shooting a Barnes 325gr .500 bullet a good bit north of 2600fps. This year I had the 458 bug, and following the 1.800 rules, cut back some Hornady belted basic brass to create the 458AIMM. Built on a model 7, 22" stainless Green Mtn barrel from Jim @ Apache, Ross Schuler brake, all bedded in a 673 Guide gun stock, Zeiss Conquest 3-9 in Warne rings, 8 1/2# as you see it. Was shooting for under 8# but this thing balances about perfect as is. Plan is to Cerakote it as I'm not much into the stainless look anymore. I about run out of case capacity for 300MP, maybe try H110 or Lilgun, although the GMX prove accurate, 2650fps from a 22” barrel not just too shabby. Beautiful rig there, Big Al...!! Ballistics are no slouch either...wow. 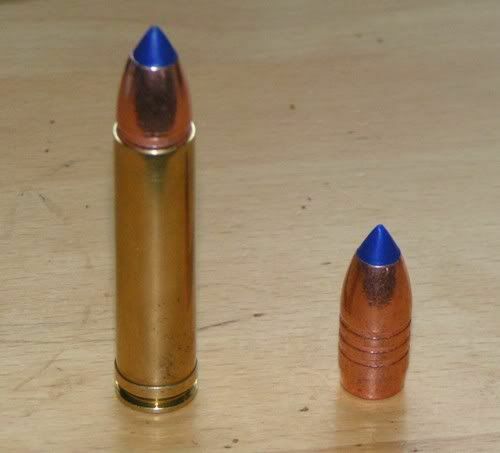 I just realized that your 250gr load (above) is the same weight and almost the fps level of a .338 Lapua mag, albeit the BCs are different...but, still...wow. Commander, anyway you slice it, those 45cal bullets become ballistic bricks after about 200yds. Once I get it painted I'll take it out to 300 and see what the drops are. 180yds is about the furthest shot I have from my blind, maybe 230ish if I'm hunting the fields which isn't often. This a 310gr Match Hunter, might try them sometime, but a little pricey. That match hunter does indeed look tempting, at least to see what a few rounds do at the range! We all see lots of discussion about the long-range performance from "whatever" caliber in gun rags and at the range cafe, but I have to agree with you that the vast majority of hunters rarely, if ever, get a clear shot at anything beyond 250-300 yards in actual practice. Some do, I'm sure, on western open plains hunting and they need the real "reach out and touch something" calibers. But I really think that if your average majority hunter feels comfortable out to 200 yards, that's really all they need to worry about. The illustrated cartridge is the 458x2" American, developed by Frank Barnes about 1962 as a belted 45-70, intended for use in bolt rifles There's a fair amount of loading data for it available in handbooks and on the web. An offspring was the 458x1.5" Barnes cartridge, which was apparently tried as a weapon for fighting in dense jungle situations during the Viet Nam war, using a suppressed bolt rifle. It also was useful in the handgun silhouette shooting game in single-shot pistols. Both of these cartridges are described in most editions of Cartridges of the World. A quick check of some reloading lists shows you're getting 50-100 fps more velocity than shown for 300-grain bullets in the Barnes 2" cartridge. I suspect it's the 300-MP powder. Bob, I had looked at that 2" a few years back for a different project, never knew they had a 1.5 version. No doubt on the 300MP and difference in speed. I haven't chronoed any 4227 loads, but in the 500 it was slower than 300MP. 1680 I want to try at some point too. I recently found that the 14th edition of Cartridges of the World is available online through Google Books. The 458x1.5" is described on page 323. This link may take you to that page, or pretty close: COTW #114. Your might have to scroll up or down to find the listing. The next page, page 324, has some loading data, which looks pretty mild. Page 522 has the write up of a shortened 458x1.5" being used in Vietnam, the modified cartridge was designated the 11.63x33.